This is my first story so apologies for grammar mistakes, spelling errors and wrong use of vocab. I wrote this story when I was stressed and depressed because I am became stranger in my new school.I didn't know how to express my emotions. This story about problems hit me down,the things I hate but it is inside of my life. 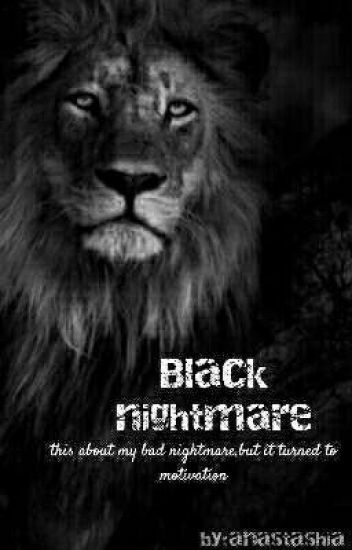 About my nightmare, and my secret place in my dream,called "Black Nightmare".When something might impossible turned to be possible. "I can not do this,it's too far.I'm too weak for this!" Kind of weird story ever I guessed,because I was too confused where I must to start it. But I'm kind of a friendly person,I can make friends easily but hard to keep friendships. People can say I'm a nerd also,and specially 'a weirdo'. I have no long some relationship with people,because I always destroyed everything with my madness.It's the hardest thing to keep a pure friendship. Aye aye,I think that's all.Let's get on with the story,shall we? I'm pretty nervous on how this will turn out and all that,I hope you guys aren't going to be disappointed. enjoy! Everyone has their own ways to escape from life, Amy has created a whole new world. Amy, a young aspiring novelist, uses her fairy-tale fantasy world to escape from her troubled life. When university and home life becomes overwhelming, the bridges between the two worlds begin to collapse and a concerning obsession is born. So concerning in fact, it leads her mother to take drastic action, pushing Amy to her limits and causing a battle no one will forget. Follow Amy's emotional journey as she attempts to take control and be the author of her own story. Achieved a score of 50/50 at the shining star awards , referred to as 'perfect'. Vivian finally meets his mate! But what if it's one she didn't expect? Vivian Rose is a 17 year old werewolf in highschool, one day, she meets this man, a beautiful man, but he doesn't want her. So he rejects her. Alpha Oakley, The leader of River Road pack, he's stubborn, he never wanted a mate, and he thought he never would, so he rejected her. But what if he regretted his rejection? "In the midst of chaos there is peace." It was a phrase Rosanna had heard her mother say quite often when she was young and it was a phrase she'd repeat to herself long after she was gone. Rosanna Paxton was left to fend for herself the age of six. And she was left with an emptiness that she filled with anger. And Rosanna's anger would not be quenched until she has gotten vengeance on her mother's killer and her father's kidnapper. Join Rosanna on her journey of vengeance. Where along the way she'll meet her best of friends, her worst  enemies, and even her greatest love. Emmaline Weston is a normal girl with a normal life except the fact that she has ice powers which she has to keep hidden from everyone which does  not prove to be difficult until she rescues Countess Maltida's grandchild from drowning  and as a reward the Countess decides to sponsor the rest of her education which is not a problem except that the duchess wants her to go to The School Of The Royals. Once there she has to keep her powers even more hidden as it is a boarding school but the infuriating Crown Prince Raymond won't let her be and she discovers that someone is after her she realises that things aren't what they seem in The School Of The Royals. She is charismatic and angelic... With a voice of a cuckoo bird. Every man dreams of her. "Under the name of help he grew as a never vanishing shade over me. "world isn't  a safe place for good hearted souls like you... I will be with you girl... Don't worry! " These are the first lines he used on me as a spell. " Leah has always fancied the sky and the clouds.She could spend all night gazing into the starry night as though something held her tightly with the sky.But when fate rolls out her destiny , and she is to face who she really is , and to join her real family , can she find her courage to hold everything together ? An heir to the sky , shall destroy the other , as the great lord rises and stirs the world to power.. Does Leah and her companions have the strength within them ? And here starts their journey to their reality. Young teen Lindsay Cooper and Jace Hamilton never really got along. But when Lindsay is forced to move into his house, their parents force them to get along. Soon, Lindsay finds herself addicted to Jace and can't get enough of him. But she also catches feelings for her best friend, Brandon Morris. What will she do? Amareth is a Divided Land of Five Kingdoms where magic, spirits and the elements combine together to bring a destiny for each individual, as unique as the person is themselves. And it's in this land of magic, spirits, animals and elements that we find Sophia-Rose Hope, who is orphaned as a young child. Sophia-Rose is taken in by her Mother's friends, who have a daughter of the same age as her, Summer Young. The two of them become the very best friends, and they stick together as much as they can despite having different destinies. Can they come together with a small group of friends to bring an end to tyranny? Or will the past bring problems that stop them in their tracks? And will they answer the big question - what happened to Sophia-Rose's parents? most of the poems are written by me. Not many are happy. But a few are. I do hope you'll take time to read them.